Pandan plant, Pandanus amaryllifolus, is also known as Rumpa and Screw Pine. A rare Asian culinary spice. Esteemed in Indonesia for flavouring rice, savoury and sweet dishes. The rose scented bracts around the male flowers are the source of the spice and perfume. Bears a pineapple like greenish-red fruit. The fruit, and the seeds it contains, are both edible. 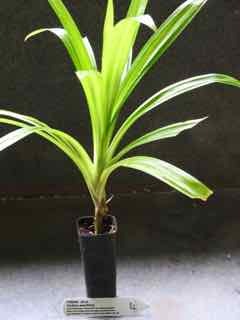 Pandan plant is a native of Malaysia and prefers light well drained rich soils in a protected, partially shaded position. Fragrant yellow flowers occur in summer. Drought and frost tender. An evergreen shrub, growing to 2m x 2m. Be the first to review “Pandan, plant” Click here to cancel reply.